Hey guys. I got a new [Now Abandoned] account. 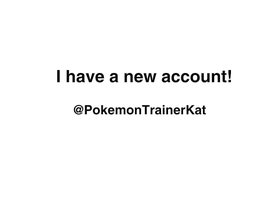 @PokemonTrainerKat. My new account is now @EliteFourKaren. Just letting you know, I'm probably never gonna use this account again. Not a job, that's for sure.